The premodern Christians emphasized the importance of dying well. It was believed that the manner in which a person died, especially his or her last moments, would not only determine a soul’s final destination in the afterlife. It was also often a summation, or a judgment, on that person’s character. We see something similar going on in a thought provoking recent anime, Bokurano. 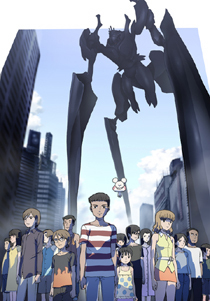 Early death lies at the center of the story’s conception, in which several children have been chosen to pilot a giant robot to save the world–but at the certain cost of their lives. The first two children are unaware of this, but later ones are, and that shapes the narrative for the remainder of the show so far. The nearness and certainty of death: is this anime, or an Ingmar Bergman film? In one respect, the children are lucky. Unlike most of us, they know how they will die and it will be very soon. The exact moment when they will be called to pilot the death robot is unpredictable, to be sure–but it is a certain and identifiable moment. If there was one thing the medievals were frightened of, it was the prospect of unexpected death. The children are spared that, at least. But that is little comfort to many of the kids. They are only children, after all. We find it almost unbearably cruel to watch children face questions that tormented even the greatest philosophers and theologians: in the face of certain death, is there any meaning to life? Has my life up to this point been a waste? Does my death mean anything? I am going to be sacrificed supposedly for the sake of others–are they worth the sacrifice? The thing is, this is only the human condition in microcosm, experienced at a young age. For we must all face these issues one day. The mortality rate, still, is 100%. How do we react to our mortality? The different childrens’ reactions to their doom runs the gamut of human emotion–from self-pity to stoicism to determined heroism, from a desperate criminal clawing at one’s object of desire, to regret for wasted opportunities and a desire to atone for one’s past. Even if the characters aren’t aware, we the viewers are aware that the last moments of every child’s life are the defining ones. The book is sealed after they are done with piloting and with life. Their story is written, and the manner in which they faced death is a measure or a judgment of who they are. As a Christian, I am reminded of another story about someone who was called to die on behalf of the world. The children in Bokurano instantly know, with no uncertainty, when they are called to pilot and die. Jesus, too, knew when it was his time, and when he was called, he went into a garden and said–not unlike many of the characters–“Father, please, take this cup from me” (Luke 22:42) He said that because he was afraid, like any of us would be if our suffering and death was just around the corner. The Gospels record his last moments in greater detail than in any other part of his life, and they did so because they tell us what kind of Person he was. And in his last moments, he cried, “My God, my God, why have you forsaken me?”(Matthew 27:46). He asked this because we ask this, when we we live in a world where even today, children can be turned into soldiers and cut short before their time. He asked this because we don’t understand why there is no end to the suffering and to mystery of death, the kind of mystery that fills us with horror and loathing and the terrifying sense that at the bottom of it all, there is nothing. I have the authority to take it back” (John 10:18). The mockings, the beatings, the crucifixion, the death: Jesus asked for their forgiveness, because, truly, they did not know they were doing. They thought they were putting an end to him, so that they would trouble them no more. They were wrong. They were dealing with someone who could take it all back. Back from the grave. Back from meaninglessness and futility. Back from the last enemy, the last boss, Death Himself. and gave him the name that is above every name” (Philippians 2:8-9). This Christian moment is brought to you by Michael Huang, because seminarians will always find an excuse to preach! You were listening to Art and Soul #1: Bokurano and the Art of Dying Well. Disclaimer: this meditation was based on the first 7 episodes of Bokurano. “Finally, brothers, whatever is true, whatever is noble, whatever is right, whatever is pure, whatever is lovely, whatever is admirableâ€”if anything is excellent or praiseworthyâ€”think about such things” (Philippians 4:8), until next time. Previous PostA Lucky Star Wallpaper only in 3 different 4:3 ratios only (800xy600 and 1024×768)! Sorry if you have wide screen and actually like this!Next PostMichael on Hiatus (of Sorts)–and an Opening Vault! Excellent effort. Usually people would sound melodramatic, but you are very sincere and hence that melodramatic factor is out. Also I love your expositions!